YuppTV Blog: YuppTV’s Presidents’ Day Sale offers more Savings on Entertainment than Ever! YuppTV’s Presidents’ Day Sale offers more Savings on Entertainment than Ever! As Presidents’ Day holiday is coming closer, YuppTV is pouring out offers to help you save more on your Entertainment Essentials. The service which offers Indian TV Channels for a bare minimum price is now furnishing them with up to 50% Discount along with coupons to save a little extra. 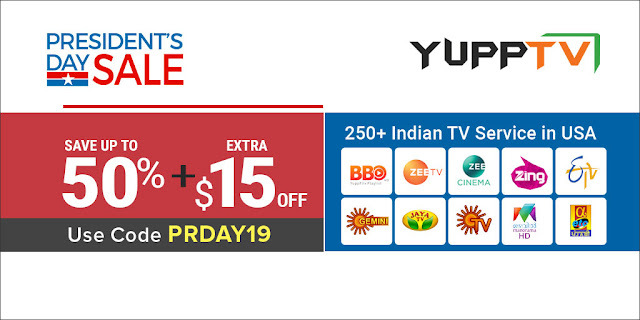 There are a million reasons why you must subscribe to YuppTV during the President’s Day sale. • The discounts are massive and have never been offered before. • All the available channels are continuously offering new Shows, Movies, Serials, and many more. • And the biggest reason of all- Assembly Elections for many states and Lok Sabha Elections are in a few months. President’s Day Sale offers Hindi, Telugu, Tamil, Malayalam and the rest of Indian TV Channel Packages with up to 50% Discount plus an extra $15 discount. All you have to do is select your package, Enter the coupon code and gain an extra discount on your purchase. Hindi users get the available Hindi Channels along with access to YuppFlix, that is being updated with Blockbuster movies periodically and AltBalaji, that is releasing New Web series every other week. You can gain access to the best of channels, Web Series and the Movies all at unbelievable discounts for an entire year. Telugu, Tamil, Malayalam users gain access to most of the Channels from respective languages. All the channels from these languages are flooding with the most popular serials and shows that are going to get better by time. Since the offer is applicable to all the available language packs, check out your favorite pack and Subscribe. Yes, Assembly Elections and Lok Sabha Elections are close and India, one of the largest democracies in the world is soon going to elect a New Prime Minister. With the current situation between the two largest parties NDA and Congress in the country, the elections are soon going to be the talk of the world. Other than this, you get access to all the latest releases from Hindi, Telugu, Tamil, Malayalam and rest of the language movies through our Mini Theatre section. Our YuppFlix holds a collection of Great Movies and Web series from Hindi, Telugu and Tamil languages. AltBalaji which is currently the biggest source of Indian Mini web series is also available at a nominal price on our platform. So, why wait? Check out YuppTV’s Indian TV packages and Subscribe. “Presidents’ Day Sale” is valid only in the USA.